Spring makes me happy! Even though we have had a very warm winter here in Alabama, I am so excited to brighten my home with Spring decor. My blogger besties and I are bringing you some Spring Inspiration this week. There are 8 of us and we live in different areas of the United States so we are experiencing very different weather but we are all getting our homes ready for Spring. This week, I worked on my front porch. I love making my own front door hangings because I like to have unique decor and I just like to make stuff! 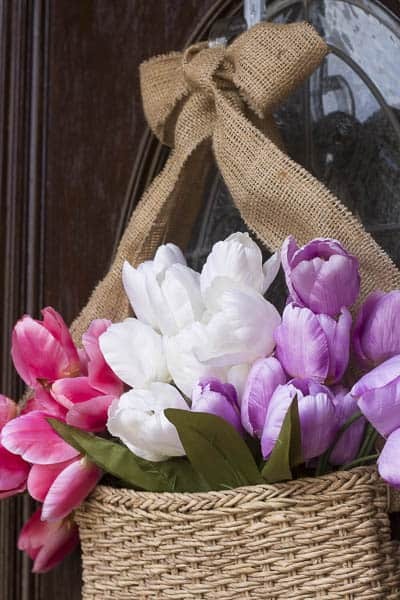 I am loving tulips and they are so popular right now so I knew I wanted to use tulips on my front door. Fresh tulips would be beautiful but not practical for every day. If I am having company, I could always pull these silk tulips out and replace them with fresh tulips, but since no one will be coming on my front porch any time soon, I will use the store bought tulips. You have to agree, the fake flowers now are so much better than they were years ago. 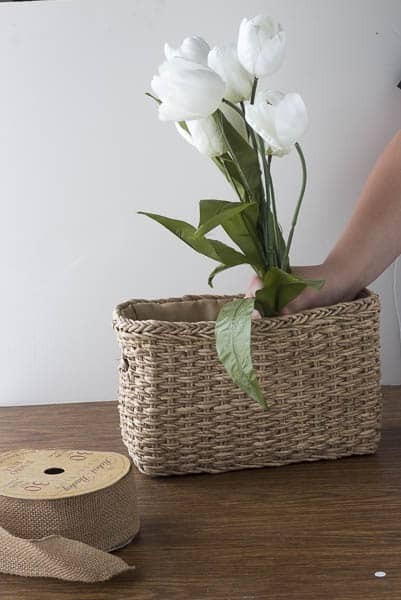 I purchased a long and narrow basket at the Thrift Store and I always keep burlap ribbon on hand. I purchased these tulips at Hobby Lobby using my coupon. You do know that if you forget your coupon, you can google Hobby Lobby coupon while you are in line and show the cashier the coupon on your phone. To make this hanging, I just sat the tulips into the basket. I ran the burlap ribbon through the holes on the sides and hung it onto the door hanger. Super easy! Now, my urns were looking pretty rough this year. I spray painted my urns using my HomeRight Spray Shelter. I really wish I had purchased a shelter years ago. So many times, I have spray painted something outside and had grass and leaves blow onto it ruining my paint job. I spray painted the urns dark gray. I moved my lanterns from inside to the front porch. I have totally updated my front porch for Spring and without spending much money. I wanted to spend as little as possible so that I will have the money to spend on plants for the yard and vegetables for the garden. Don’t forget to check out my best friends blogs for some gorgeous inspiration. You may also like these other Spring decorating ideas. 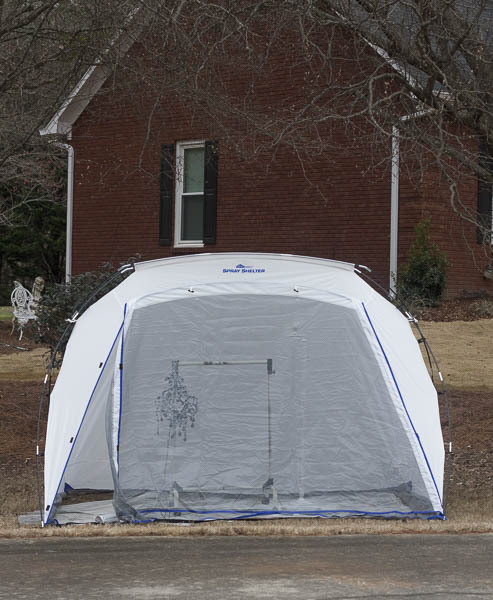 Isn’t that HomeRight spray shelter a life saver! I can’t believe how many times I pull mine out for different projects. 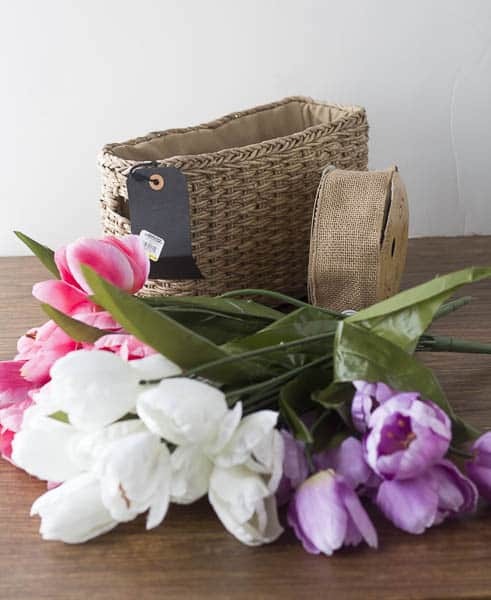 Your basket for the front door is just darling. What a fun way to add a touch of spring to the front door. 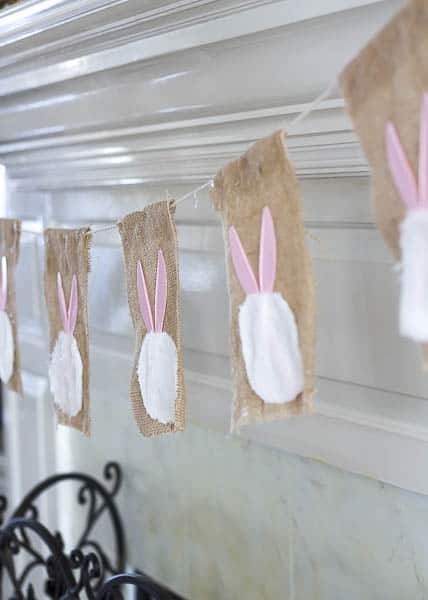 The photo for your bunny table runner looks like it was pulled from a pottery barn catalog. It is that good! You are talented my friend. 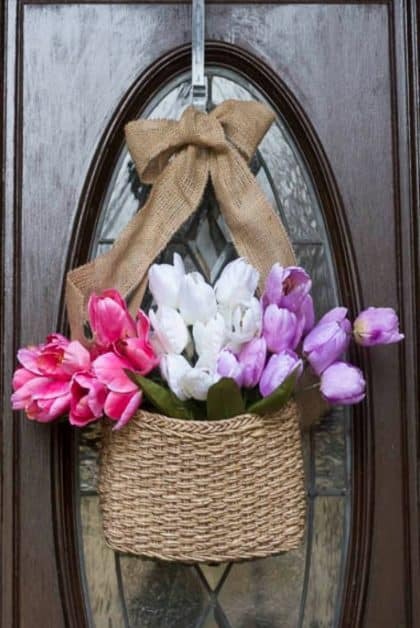 I absolutely love that basket for your door, and tulips are my fave! I love the lanterns too, it is all perfect together! What a great spring porch refresh! It always amazes me what a little paint can do. The urns look great, and I love your tulip hanging basket. You can never go wrong with tulips in my book! Hey there friend! Spray painting your urns made a huge difference! Really updated them! 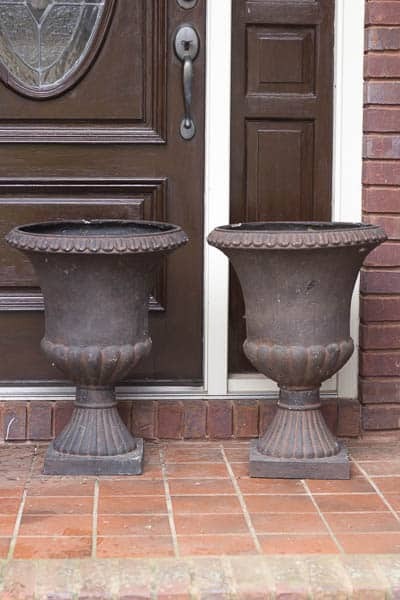 I have those urns on my front porch too and just love them! I think I bought them before we even moved in 12 years ago. Sherry, I love how you get so creative with thrift items. 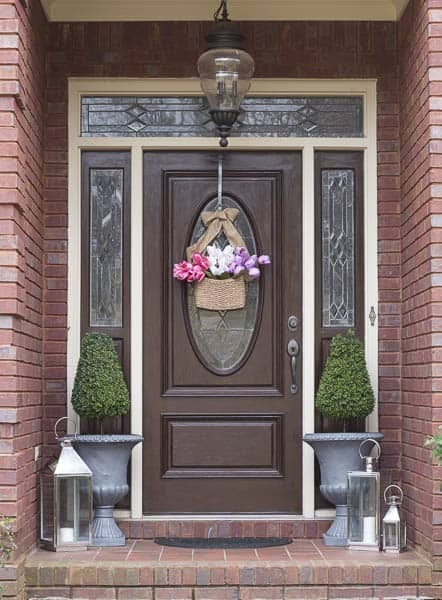 I love the basket on your door and adding the burlap to tie to the door is awesome. Tulips are one of my favorite flowers. Unfortunately, we don’t have room on our small porch for a large urn. 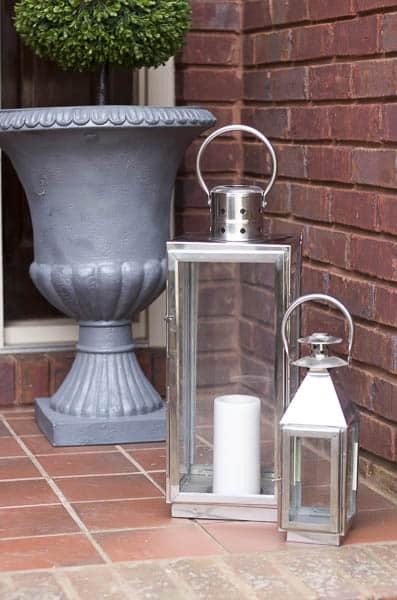 I think they look great on porches and yours looks fabulous after you painted them. Your front porch looks great but I have a suggestion. The topiary trees need a little color. How about a pink or lavender bow on the stems to bring in some color at the bottom. You are so lucky to have such a great space to decorate for different holidays and seasons. Maureen, Thank you! That is a great idea! Love your front porch Sherry! Love your thrifted basket that you hung on your front door! 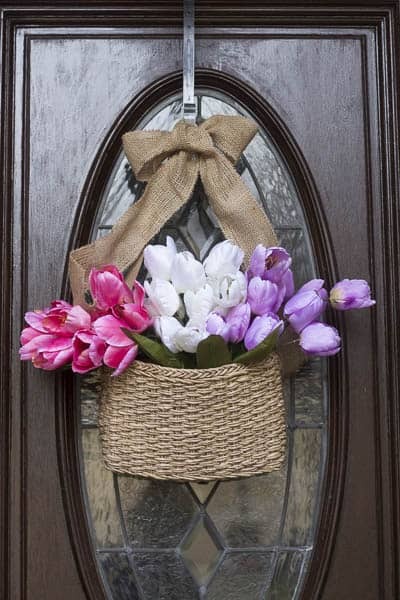 This is such a fresh and pretty door decoration for spring — a nice alternative to a wreath. Your urns look great after spray painting. The paint really revived them. Your porch looks so attractive for spring. That is DARLING! I may have to spruce up my front door now. You make it look so effortless. Simply elegant! 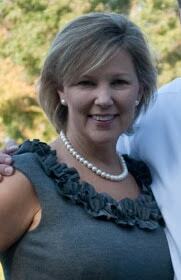 Love your front porch Sherry! Thank you for sharing @Vintage Charm!